Long time no post. Shall I catch you up? There has been feline chaos in our house. My Skittles and Zephyr are not getting used to my son's cat, Hunter (who is visiting while my son is on course until November). They show their displeasure frequently. Hunter is a very sweet and loving cat with the human population. But with the other kitties in this house, he most definitely lives up to his name. He sees a moving cat as a challenge and will often ambush them on their way to or from the litter boxes. For this reason (and because cats are vindictive creatures by nature), they are frequently finding other areas to pee. I know it's a sign of their distress. They have never had a problem with inappropriate peeing before. My cats are old (fifteen) and they can not hold their own with this large, strong, young (three) male. When Hunter attacks, he really hurts my guys. He'll jump them, bite the back of the neck and kick hard with his hind claws. There is a lot of screaming (from the victim and from me!) during these sessions - which happen at least once every couple of days. A spray bottle helps break it up but there's not always one at hand. If we're lucky, it can be averted altogether if we happen to notice Hunter's tail just before an attack. It gets all bushy. Hunter is an otherwise sweet cat, and he seems genuinely perplexed when he is removed from the situation for a time out in the laundry room. He is always isolated at night which bothers me more than him. But my guys need some peace. Come morning, he's full of purrs, piss and vinegar. We've gone to considerable expense trying to eliminate the problem and the odour. We've invested in this (far too expensive for the area we need to cover) and this which was 100% useless at $125 for the diffuser and spray. Next up we're going to try this much less expensive solution. From what I'm reading, it sounds promising. Despite the unpleasant atmosphere, we've still had a few guests come to visit. My cousin Marcy, Frank's friend Peter and my son, Jeffrey have all spent some time here over the last few weeks. We're hoping to have more company through the months of September and October. And less cat pee. Our family is mourning the loss of our dear Auntie Gertie, earlier this month. She was my late Dad's youngest sister, and the last one standing from his generation. She was a wonderful lady with a quick sense of humour and I will miss her dearly. Some of you might remember my post when Frank and Jeffrey demolished her sofa. And some of you might also be familiar with my cousin Phyllis who blogged over at Prompt Prose and eFoodAlert. My aunt was mom to her and her sister, Barbra. Phyllis' blogging is on hold while she is writing a book and moving house. Our renovations are still incomplete and untouched for several weeks at a time. Someone is supposed to be coming out again next week. We'll see. And with that update, I'll move right along with a few photos. This is the view from one of the many side roads which surround our place. The numerous hills and valleys are less fun in the winter but every bit as beautiful. One of the many rickety barns which charmingly dot the countryside. 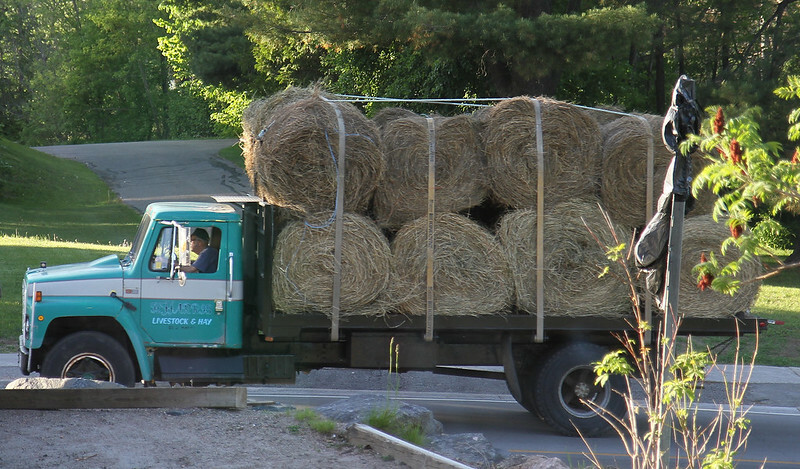 Of course, if there are country roads and barns, there's going to be hay. This truck was spotted rounding a corner and the photo was snapped from my seat inside a Bancroft, Ontario restaurant. 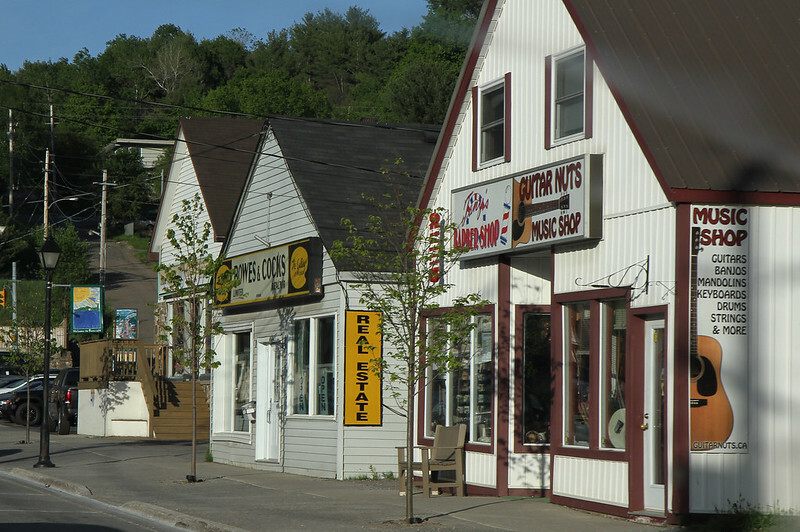 If you're at all curious about Bancroft, here's a small look at one of its side streets. It could just as easily be Mayberry, with that bench outside of Floyd's Tony's Barber Shop. This sad memorial stands by the highway a few kilometres from our house. I tried Googling the name, location, dates.. etc but came up empty. He died heartbreakingly young at 19. ... we were able to catch some lobster at the local grocery store. 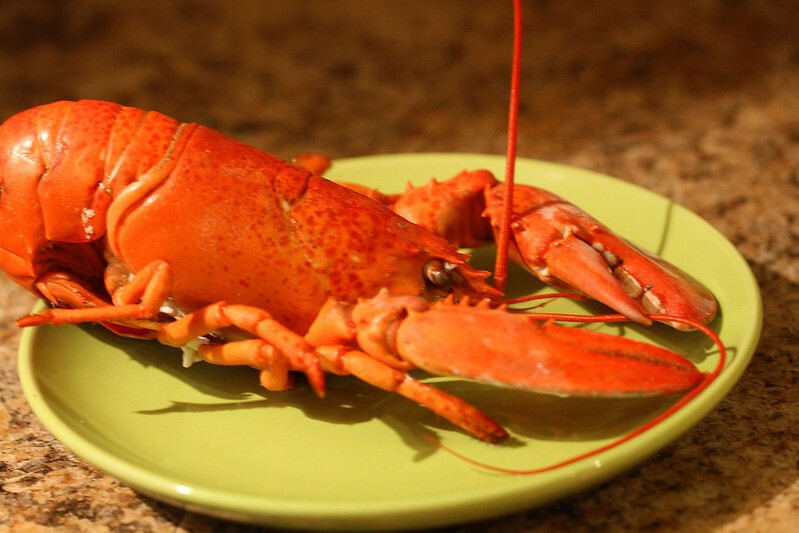 Dipped in garlic butter... yum! What a joy it is to feel the soft, springy earth under my feet once more, to follow grassy roads that lead to ferny brooks. Also yummy with garlic and butter are fiddleheads. 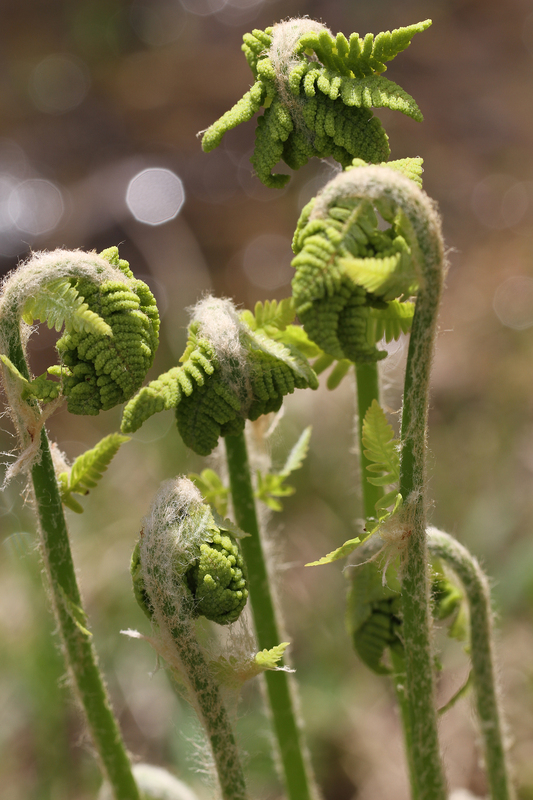 I don't think these are the right ferns for fiddleheads, and if they are, they've already passed the stage at which they're prime for picking, but if you ever get the chance to eat some, don't pass it up. They're delicious. Growing amid the ferns are the fruits of the previous owner's labours. 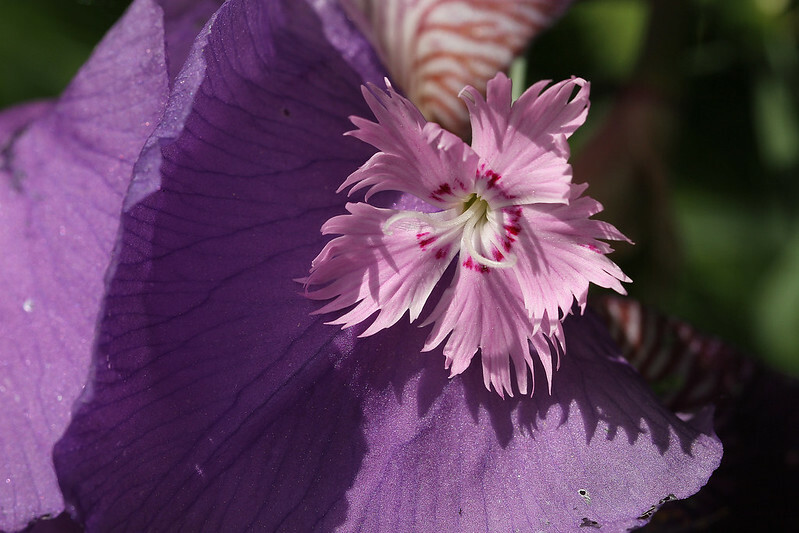 She planted lovely flower gardens in both the front and the back, and we're enjoying it all immensely. Thanks, Josie. The chickadees are also enjoying our space, along with the seeds and occasional fruit left out for their dining pleasure. Don't you just love their ever-watchful little black button eyes? That's it for this post. More photos coming up next time. ooh, sorry about the cat wars! i'd be worried for my older ones, too! Sorry about the feline problems. You sure have some beautiful photo ops around you. I like the road and the barn. 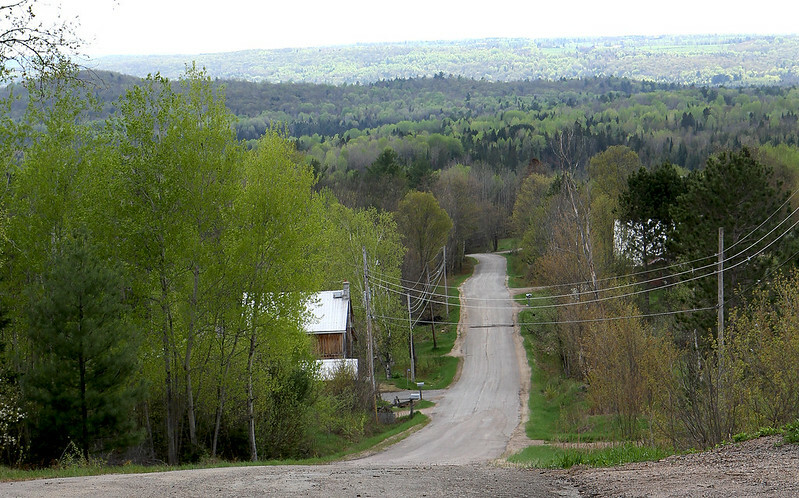 I recognize that street in Bancroft and have been inside the real estate agent and they took us to a few places. right about the time they get used to each other (maybe) it will be time for Hunter to go home. I have my sister's two little dogs for a week and my cat is always annoyed when they are here. They don't bother her having two cats of their own, but she just doesn't care for other animals in her house. love the pic of the ferns. Sorry about the kitty disagreements. Love those pics. I always feel I am right in the photo. I am so sorry about your aunt's passing, Hilary. And I do hope that things resolve themselves with your furry friends. I'd be very concerned about my older cats, too! I'm glad you lock up the youngun at night to give them some rest and peace. Sometimes the simple home remedies work the best. I hope that recipe does the trick. The invader does need to be isolated to keep them from doing what comes naturally. I really enjoyed the various sights along your paths. They are wonderful shots. We must visit Bancroft soon, haven't been up this year. 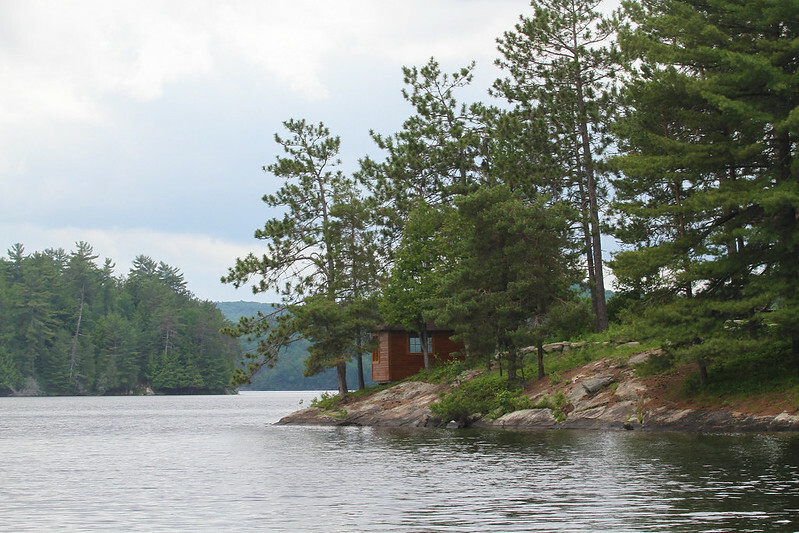 As a young girl we used to rent a cottage on Baptiste Lake, some really good fishing memories from there. Your part of Ontario is gorgeous. Holy Hanna, a TV without sports...What is the point? By the color I'd say that is a Canadian Lobster, a little tougher than the Maine variety, but still quite sweet and tasty. We once decided our older cat was lonely so we acquired a younger cat to keep her company. The older cat hated being picked on and began peeing everywhere, so I can sympathize with what you're going through. Great pictures as always. So enjoyable. Beautiful Lobster, alive not dead. The beauty of the bird, treasure. All the photos are excellent. You've had a very crazy mixed up summer. You've also got some great photos to show us. I hope things settle down after this because I want to see super posts again. There is just nothing worse than cat pee.......and trying to neutralize it. Maybe another foster home for Hunter??? My condolences for the loss of Aunt Gertie and for the kitty wars. It can be very difficult to introduce a new cat in a house. Our cat Squeak won't let another cat near her territory! We had my Granddaughter's cat for a bit but Sammy had to stay outside all the time. He and Squeak had a truce..he stayed in the front yard, she in back..worked good for them! Love your quaint little town and beautiful scenery. I don't think I'd like to drive those roads in Winter, but it sure is pretty! Hilary: I was very sorry to hear about your Aunt. I also hope the Cat situation resolves soon. Quite a lot to deal with, for sure. Cat wars! Very tricky and tough for all concerned. We have a bit of animal apartheid in our home too, as the dog wasn't brought up with cats and still thinks they are there to be chased. Leave a door open, and she is at their food too. They aren't too keen on her either but have learned to get along with each other most of the time. At least you know it's not for too long. And commiserations about your aunt. It is all so pretty, but those fiddleheads!!!!! Cats. Never a dull moment, right? I could easily make my blog a cat blog but that would likely be the no turning back point of being a crazy old cat lady. That sofa! It was so unique. A shame it needed to be destroyed. I am sorry for your loss. Remember when we were young and it was baptisms and weddings? Now it is funerals. Orange is the New Black. I won't give away a think but I stood up and cheered during the last episode! So sorry for your loss as she seems to have touched all of your lives with love. I am concerned about your cat issues because you may have a serious problem getting rid of ALL the odor. Others may always smell it in your house. Not yet a netflix fan, but used to be a member decades ago when they mailed DVDS. May your Aunts memory be for blessing. May the cats fighting, frighting and peeing be a memory. Your photos as always ARE a blessing for our eyes. So sad that young boy dying at 19. Your photography inspires me to try to get more "enjoy the place and the time" type photos. I love these. Sorry about your aunt and the cats, but thanks for the beautiful photos! We have a doggie visiting this weekend. My old lady cat doesn't take too kindly to strange animals visiting. Sure hope we don't find any surprises in the morning. I LOVE Bancroft. My sister has a summer place near there. We always talk about moving there now that we are all in retirement but whether that happens I don't know. My greatgrandfather was born in Maynooth! Some people I know moved there not long ago to open the tea shop. Ann keeps telling me we should move THERE. Your son is going to owe you - big time! Thanks for the tour of your area. That shot of the water is idyllic. What beautiful countryside! So sorry for your loss. Hopefully the cats begin to chill out a bit. I think Hunter would have to be in separate quarters somewhere if it was me. I couldn't have my established elderly cats upset like that. Your photos are excellent and I loved the unfurling ferns and the cheeky little bird. Poor you, having to deal with cat pee and cat mayhem at the same time! Your pictures in this post are really nice. 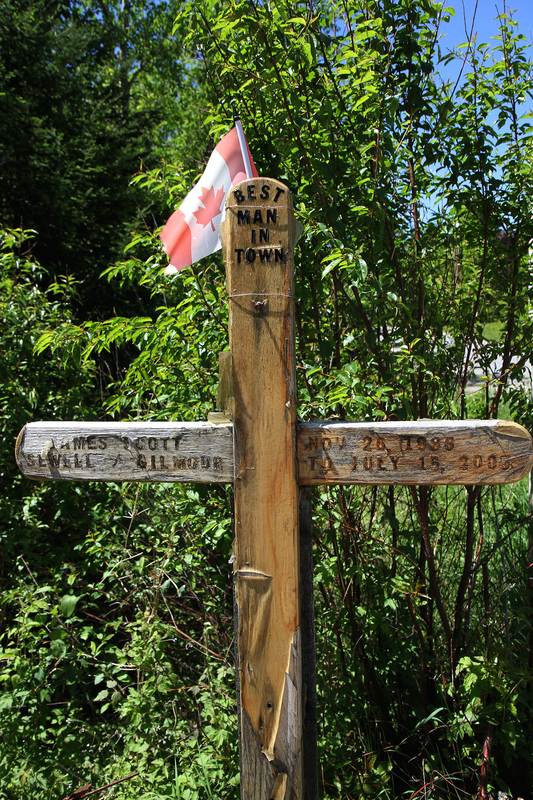 I love the memorial post... Best Man in Town.... now that's a real compliment, what a great way to be remembered. But so sad that it is there at all. So sorry about your cat predicament. I do hope things will get better. Such gorgeous photos Hilary. You definitely live in God's Country. I just love "Mayberry". It would be so much fun to scope out. 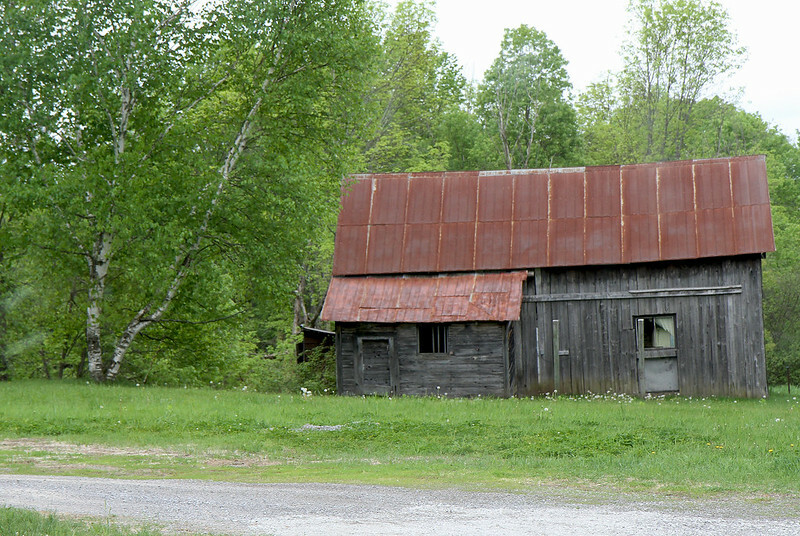 Rickety barns are some of my favorite things to see. Seeing your picture of the road really gives me Wanderlust. We haven't been much of anyplace this summer. I desperately need a get away...soon!! Thanks for the update and the pics. But the cats are a whole different kettle of fish. I hope things will settle down. Mind you, we lived with a pair who fought a lot, one always lying in wait to swipe the other. Until one of them died (of old age). Aw. look at that cute little guy. I do love a good chickadee photo. I'm sorry to hear your cats are not getting along. Hope you can find a way to work it out. I am so sorry about your Aunt Gertie, and also the cat pee. We've had an old dog in the house quite a bit and the bladder that goes with one, which isn't very reliable. I hope Hunter settles down and minds his manners! I love seeing your little town...and I've never heard of fiddleheads! My condolences about your Aunt. Yes, cats can be terrible. Males are the worst. I've had them liek this. When my mom was ill and we were travelling to Muskoka my male cat started this. He wanted attention or something. What a pain. Good luck with this. Loved seeing a bit of your area and the little town. It's so cute! Oh dear, sorry to hear about your aunt and of course the cat wars. It is not fun when one has to contend with a bully cat, no matter how adorable he or she is! I had a girl cat that dominated the whole neighbourhood! I made sure never to spoil a kitten like that again, that's for sure. The above is my nomination for a POTW. I am too lazy to log into my other email with your address!! Your photos are amazing. Such a pleasure to look at. Oh that sassy cat! I hope he learns to mind his manners soon so that your poor dears don't have to suffer his wrath anymore. So very sorry to hear about your Aunt. My condolences to you and your family. What gorgeous pictures. They just make me smile. Yup, good old vinegar and baking soda - should work this time! So sorry to hear of your aunt's passing. I don't there there are any of that generation in my family alive - maybe some distant relatives in Holland (mom's side), but none over here. Makes us feel old, doesn't it? Love your pics, especially the water one. And the sweet chickadee. I have so many of those at my feeders. Life is slower where you now live but still manage to spy interesting things to photograph. Glad to hear you have your own TV and are checking out Netflix. This past week I have been watching Criminal Minds on Netflix. In between the moving of course. OH oh... hissy and pissy. Enjoy seeing your slice of life! So sorry for your loss, Hilary. We're on that side of life where those around us are hanging up their shoes. I just returned from spending time with my father in Gatineau. He's looking frail now... but it is to be expected. Hilary, my condolences on the passing of your dear aunt. It's always difficult losing someone special to us. It is sad, too, that your cats are being tormented that way. I don't blame them from retaliating, but phew. 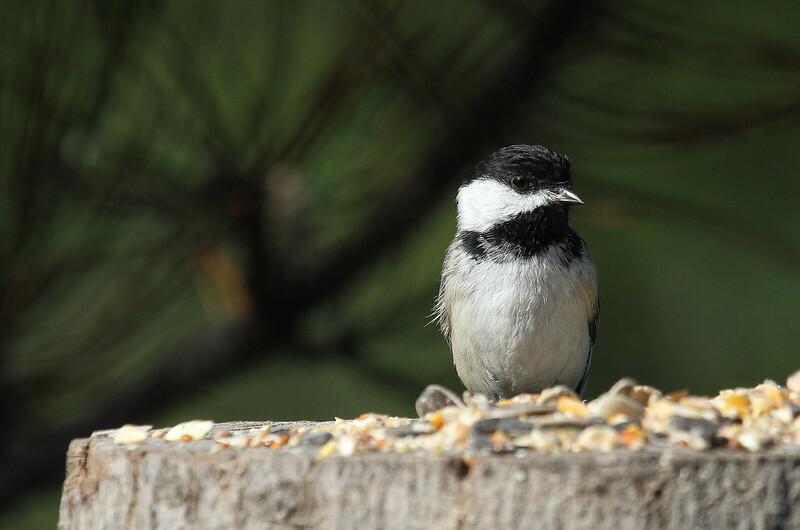 I love all the photos, most especially the chickadee. So cute.